Is a precision instrument which can quickly measure tensions of 1/4 in. (6.6M) Extra High Strength, 5/16 in. (6M), 3/8 in. (10M) and 7/16 in. (16M) Utilities Grade, zinc coated guy wires and messenger cables per ASTM A-475. No battery to run down and let you down-100% mechanical. One piece construction measures all sizes. No saddles to loose. Used on strands having less than 10,000 lbs. of tension. The Tension meter measures tension in pounds force with an average accuracy of plus or minus 3%. The maximum error magnitude can be the greater of 7% or 150 pounds force with a 3% frequency. 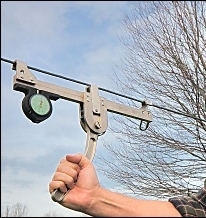 This plated steel instrument measures the force required to deflect the strand to an out of line position, registering this force on an integral dial. Is furnished with an analog thermometer, temperature compensation charts, detailed instructions and a hard shell plastic carrying case cushioned with foam rubber for protection. A registered serial number is stamped on each handle.